Departure at dawn (05.00) 15th April 1982. 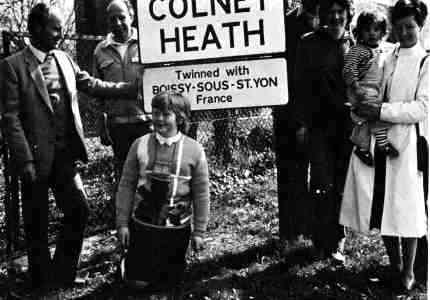 Our three representatives: Martine VIGNERON, Claude CHERDO, Michel GABILAN, after a historic but hard journey arrive in Colney Heath at 12.30. From the first day, the tiredness from the journey was quickly forgotten thanks to the very warm welcome of Mr and Mrs THRESHER. After a short stay with our hosts, Mr and Mrs Howard, Mr and Mrs Dyson, they visited Hatfield House, an historic home. Then, evening at the local pub managed by Jock and Ann CHRISTIE. Tonight the pub was as lively as a party. Pleasant and friendly mood. After waking in the morning, we visited the local scouts and parochial church of Reverend David VENESS. A jounalist took our photos in front of the twinning commemorative plaque. Then June PUMFORD showed us around the school. There we were pleasantly surprised to discover the New Year cards, posted by the children of Boissy, prominently displayed on the wall. Typical English lunch with John and Mary PRODGER. The afternoon; a visit to the Clock Tower and then St Albans Cathedral former abbey, now parochial church. On the way back, we stop in the tea shop and visit the STUCHBERRY family who had been kind enough to put up a banner with the following words: "Welcome to the lady and gentlemen from Boissy". Evening, declaration of friendship ceremony at the Charles Morris Hall in Tittenhanger which was decorated with French and British flags. This friendship declaration was signed by the representatives of Colney Heath and the representatives of the committee of Boissy; the Mayor of St Albans (Mr JENKINS) participated in this ceremony. Walk around the local market, dinner with Mr and Mrs DYSON then, the afternoon, our delegates went to Colney Heath v Hatfield football match and met the representatives of local associations and the members of the Twinning committee. Evening, celebration with red and white wines, more than 100 people present. Michel GABILAN, as usual, sang a little song. During these ceremonies, many gifts were given to Boissy: the friendship declaration framed in Box wood (to recall the etymology of the name of Boissy), a Wedgewood plate in earthenware showing the London monuments, an engraving of St Albans Cathedral (presented by the Mayor Mr JENKINS), two tee-shirts, a photo of the local church, a magnum of champagne, a pretty photo and a book. Return to Boissy. Crossing eventful: the sea was bad and the hover-craft was heavily shaken. 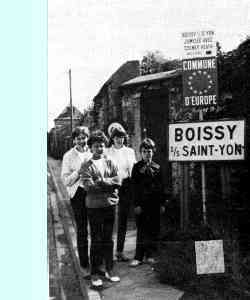 The mood was friendly, warm, and our delegates felt that our English friends wanted to see the development of many contacts with the population of BOISSY. This was the occasion when it was decided that a delegation of about thirty persons will come to the Boissy school fete on the 19th and 20th June.